They do, AJ, and I did depress that, but my keyboard does not have the normal "adding machine" number layout. My numbers are arrayed across the top of the keyboard and the directional keys are to the lower right. 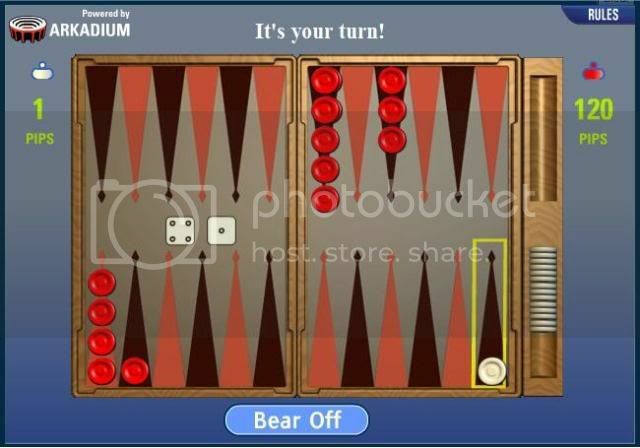 I beat the backgammon twice, but have lost about half a dozen or more. I may shut the arcade down for about an hour, but exactly when, I am not sure. The arcade add on is a standard SMF modification. I am testing out a more advanced version that is a heavily modified version by a private programmer. It has more features, is lighter on the server, and more games will work with it. When I am ready to make the switch, I will announce it ahead of time. I'm sure we can all live without online games for a whole hour, Buster. Thanks for the upgrade! I am sure we all can. The problem is if someone doesn't see the message and tries to access a game while I am converting, it could cause some issues. Upon second thought, I may have to put the forum into maintenance mode long enough to get the switchover done. I have a couple of other small maintenance issues I need to attack as well, and it would be better to do it with the forum offline. I am not ready for that yet anyway. Your a great Mod, here have a cold one on us. i play majhong a lot but this one really makes me want to tear my hair out....its so difficult.. I have spent most of the day in my shop rebuilding an engine for a generator, and repairing the electrical portion of another generator. My fridge in the shop died, so I have no cold ones out there. It is too much trouble to clean up long enough to come back to the house for one. Next purchase- fridge for the shop. @Linda, once the upgrade is completed, there will be a few more majhong versions that may not be as difficult. Most of the games on there are quite challenging for me too except for the poker, the odds seem to be stacked in our favor. When I was young and single a roommate and I took a fridge and removed the shelves and racks and drawers then inserted a perfect fitting horse keg. We used that thing for over a year like that. We still had enough room on top for jumbo packs of hot dogs, ketchup and mustard. DELTAKANE USURPED MY #1 POSITION IN BILLIARDS!!! I tried but there's no room for error left. The upgrade is complete, and a few more games are there as well. Everyone was offline, so I took the shot and did the switch. I play some MahJong, but like Linda said, this one has me pulling my hair out...almost. No badgers, but I got me a couple of error log gremlins while I was at it. They have been irritating me for a few weeks. i got 'em.